In many respects, this biopic of the titular fashion designer is everything you might expect. It is full of beautiful people wearing beautiful clothes in beautiful surrounds. Fortunately though, Yves Saint Laurent is much more than that and we do get some insight into a man whose demons very nearly threatened to derail his reputation and career on more than one occasion. Too often, biographical films try to cram too much into the limited running time that a motion picture necessarily demands, so it is very pleasing that director Jalil Lespert has avoided the temptation to cover every stage of Saint Laurent’s life and career, opting instead to focus, for the most part, on his emergence as a pre-eminent figure in French fashion circles and the ensuing bouts of self-destructive behaviour that threatened to overshadow his creative genius. The film does touch on the later stages of Saint Laurent’s life, but primarily to contextualise the relationship with lifelong partner Pierre Berge, who we first meet in a pre-credit sequence set after Saint Laurent’s death. The story is then told as a recollection of events from Berge, who provides a second-person narration as though it is being delivered to Saint Laurent himself. Pierre Niney takes on the role of the Algerian-born Saint Laurent, who we first meet at home in Oran on the Mediterranean coast. Whilst still in his teens, Saint Laurent finds himself working for Christian Dior, whose death in 1957 propelled Saint Laurent into the role of head designer at Dior’s fashion house at just 21 years of age. Already encumbered by a social anxiety that he attributes to childhood bullying, Saint Laurent finds it difficult to cope with the aura of expectation that surrounds him. When he is drafted into the French military, Saint Laurent finds himself unable to cope, is confined to a psychiatric hospital and subjected to electroshock treatment. 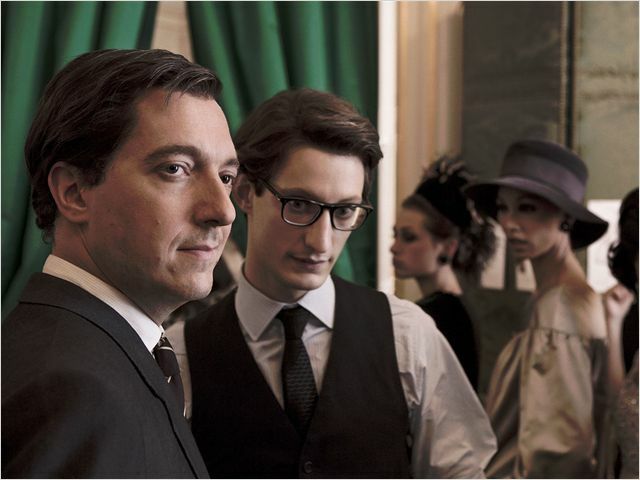 Sacked by Dior as a result, Saint Laurent establishes his own brand with the help of Berge (Guillaume Gallienne), a cash settlement secured from his former employer and the support of an American investor. From this point, Saint Laurent emerges as a superstar of the fashion world; each new collection met with adoring enthusiasm. However, whilst his professional profile explodes and he cements his reputation as one of the truly great designers, he sets out on a path of self-destruction; partaking in drugs, excessive alcohol consumption and infidelity in an effort to combat the depression, anxiety and insecurity that plague him. This is very much a film that examines the relationship between Saint Laurent and Berge, with the latter emerging as a stoic hero figure who stands by Saint Laurent throughout the tumult that was their personal and business relationship. If what we see is to be believed (and I have no reason to suggest we shouldn’t), then Berge was a guardian angel for the troubled designer, serving as manager, constant companion, lover and lifesaver. It is hardly surprising therefore that the real life Berge has endorsed the film, which is based, in part, on his book Letters to Yves. Furthermore, Berge has praised the performances of both actors, telling Vogue magazine that he was “blown away by Pierre Niney’s performance. It really disconcerted me. It even upset me, because it’s very difficult. At times, I thought it was Yves Saint Laurent himself. That’s huge.” On Gallienne, Berge declared “I think he’s an extraordinary actor.” Of course, as a result of Berge’s ties to the project, the filmmakers were granted access to Saint Laurent’s original design studio and more than 70 of his vintage outfits and, it must be said, the clothes are stunning. Another key figure in Saint Laurent’s life during his rise to fame was model Victoire Doutreleau (played by the stunning Charlotte Le Bon), who was one of Saint Laurent’s few close friends until forced out of his life by Berge, who considered her a bad influence. Yes, the film is a celebration of Saint Laurent’s creative genius, but it certainly doesn’t shy away from the darker side of his personality. It is a reminder of the destructive nature of disorders such as depression and anxiety, even amongst those who seemingly have it all. The film looks elegant – sumptuous even – and the musical score draws upon classical, jazz, rock and opera at different times, to mostly good effect. 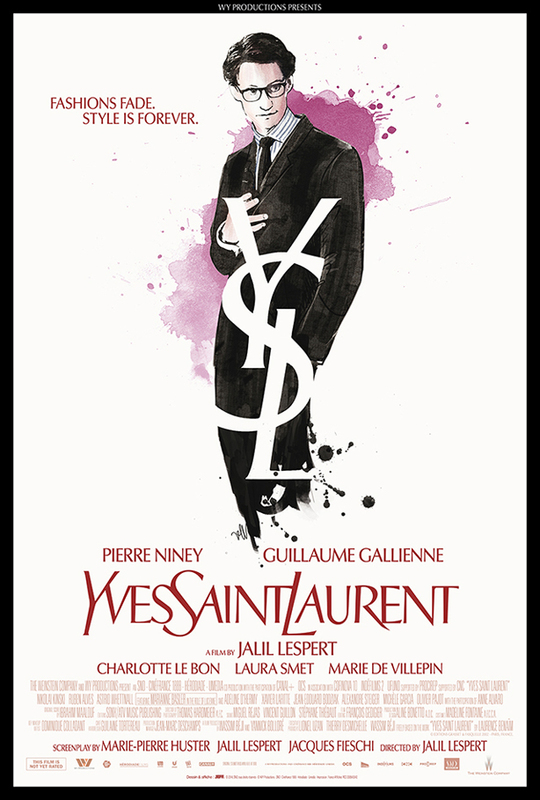 Ultimately, Yves Saint Laurent is an engaging, if somewhat genteel, examination of the life (or part thereof at least) of a talented yet troubled individual. Lespert has crafted a film that explores the darker side of Saint Laurent’s personality without diminishing his legacy as a fashion icon. Next Next post: What’s Wrong With The Australian Film Industry?